First order of business was shopping, not just food for my last evening but also for the coming week for Nikki and Richard. I always love visiting grocery stores when I travel, as it is a great way to see a very basic way in which life is different from back home. Australian grocery stores aren’t dramatically different from American ones, but they don’t have all the same products. There are British imports as well as Australian goods (including some wonderful, local cheeses), and a lot of wonderfully exotic produce. So I had fun doing even this. When we got back to the house, Nikki took me on a tour of the garden. Richard has put in a pond for her, and she has filled large areas with beautiful flowers. Most intoxicating of all, however, was the hedge that surrounded the garden and had been grown into an arch over the entry grate—it was all rosemary. Every time I brushed against it, the fragrance of the herb surrounded me. Simply wonderful. For dinner, Richard prepared a barbecue of kangaroo basted with his apricot/honey sauce. He was very pleased to get a chance to use his new grill. Nikki and I helped with sides: pumpkin, potatoes, and noodles. Of course, Australian wine was also on offer. Surrounded as we were by wineries, it was only reasonable to enjoy some local wine. 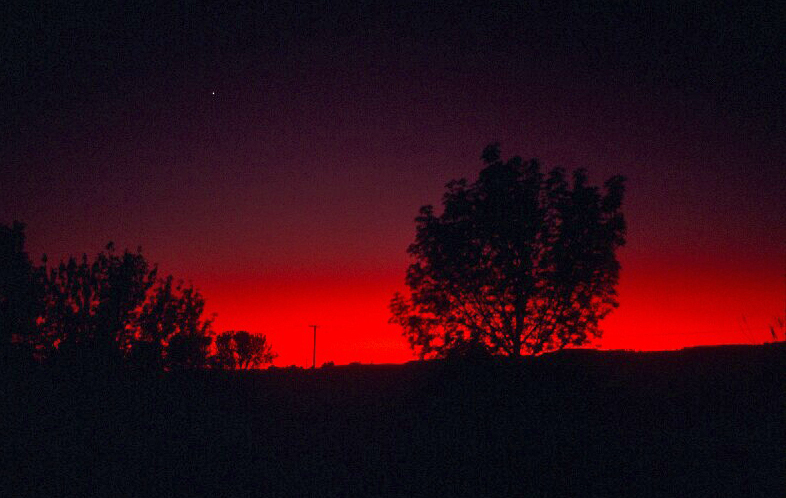 There was a lovely sunset and we were still outside when the afterglow turned crimson. After dinner, we watched videos of Australian destinations, discussed books, and talked. Nikki put on Mozart and served port, coffee, and chocolates, as Richard set about helping me plan my onward journey across Victoria. He had an abundance of maps and valuable suggestions about places I might have the easiest time finding a nice hotel with lots of character and routes that might show the countryside to advantage. Lovely to have so much information before heading off again–and maps. Having not had maps for my Sydney to Brisbane drive, earlier in the trip, I was delighted to have maps for my next long drive. I didn’t want the evening to end, but I need to get an early start and Nikki and Richard need to go to work in the morning. So we parted company with promises to try to get together again someday. Up early, breakfasted, and on the road. We traded the seashore for broad wheat fields and sheep properties dotted with charming, small, rural towns of vintages similar to those we’d already seen. We drove through Crystal Brook and then Gulnare. The terrain and the crops changed as we got to Clare. 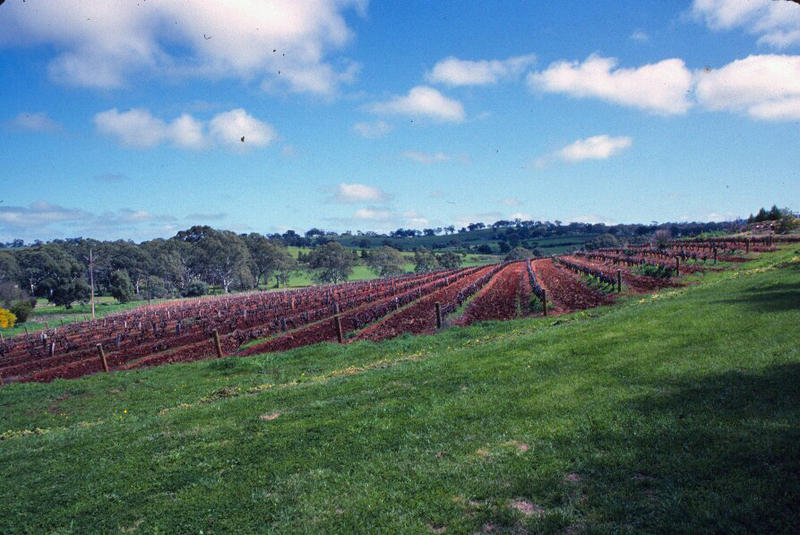 Settled in the 1840s and named for County Clare in Ireland, the Clare Valley is one of South Australia’s excellent wine regions. Sheep and wheat gave way to vineyards. 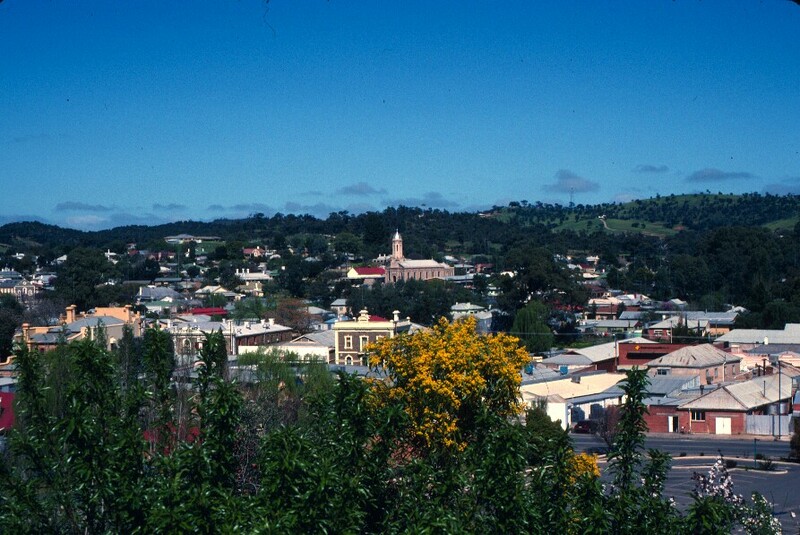 As the term “valley” suggests, there are hills surrounding Clare, the old town at the center of Clare Valley. This town is larger than the rural towns through which we’d passed, but it was just as charming. Richard headed for a hilltop that would give us a good view of the town before we headed in and through. Nikki and Richard share a love of fine wine, so a stop at the Wolf Blass Eaglehawk winery was deemed a necessity. The winery was handsome and the surrounding vineyards were lush and well trimmed. It’s spring, so no grapes are in evidence, but the vines were handsome in their neat rows. Continuing down the Clare Valley, still surrounded by thriving vineyards, we came next to Watervale and then to Auburn, on the southern edge of the valley. Continuing southward, we came to the town of Tarlee, which blends old and new, with historic buildings and services to accommodate surrounding farms. 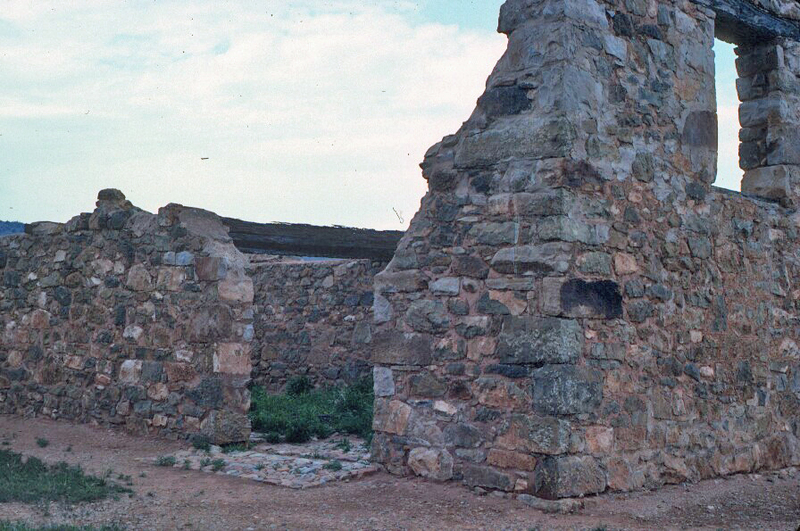 Stone quarries here supplied the stone for many of Adelaide’s most notable buildings, and that same stone was much in evidence even in the more modest buildings of Tarlee. Tarlee is a crossroads, and it was the road that drew us onward. Richard and Nikki have to work tomorrow, so we needed to get home at a reasonable time. But not without eating. We picked up food in Tralee, and then we stopped a bit farther down the road for a picnic lunch. Richard chose a handsome spot on the banks of the River Light. This river was named for Colonel William Light, who designed the city of Adelaide and named the Barossa Valley. The grassy spot was shaded by huge gum trees, and we could hear no sounds other than the river and the many birds as we dined. If you look at a map of South Australia, you’ll notice that the sea, in the form of Spencer Gulf, cuts inland a fair distance, and as a result, the Flinders Ranges actually touch seawater at this point. (Which is why the ranges got named for a navigator.) Hence, while the mountains were still visible, we headed toward salt water. We stopped in Port Germein, a small town (population around 200) that was originally settled as a shipping port. With easy access to gentle beaches (good for both swimming and exploring tidal pools) as well as the mountains, it’s easy to see why this is a popular eco-resort area. We stopped to admire the wooden jetty, built in 1881 and still the longest wooden jetty in the Southern Hemisphere, at just over a mile in length. Originally constructed for shipping wheat, the jetty is now the place where locals go for a bit of quiet fishing. Following the coast, we came next to Port Pirie. Facing the waters of Spencer Gulf, Port Pirie is still within the boundary of the Flinders Ranges. 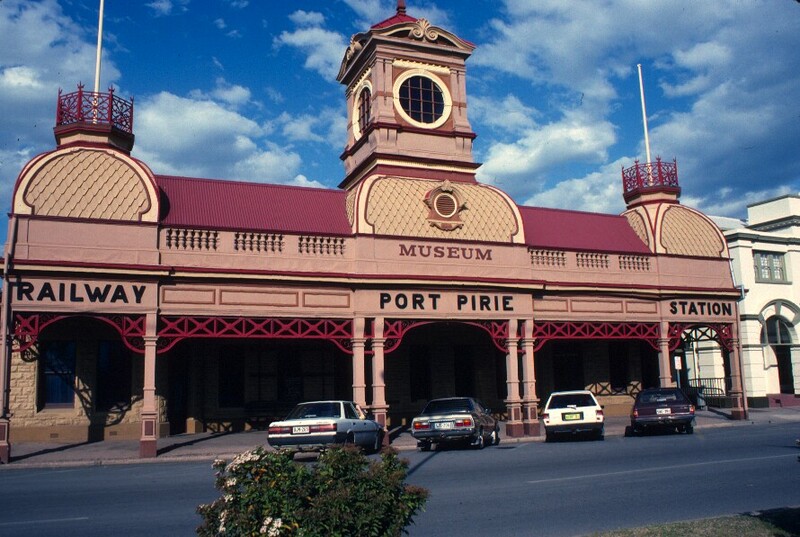 The town’s history is tied to the railroad, and Port Pirie was once one of Australia’s busiest rail centers. Reflecting this past, the city’s National Trust Museum is housed in a former railway station. Final stop of the day was in Port Broughton, where we pulled up at the Port Broughton Hotel. Surrounded with Norfolk pines and with a view over the sea, the location of the hotel was splendid. 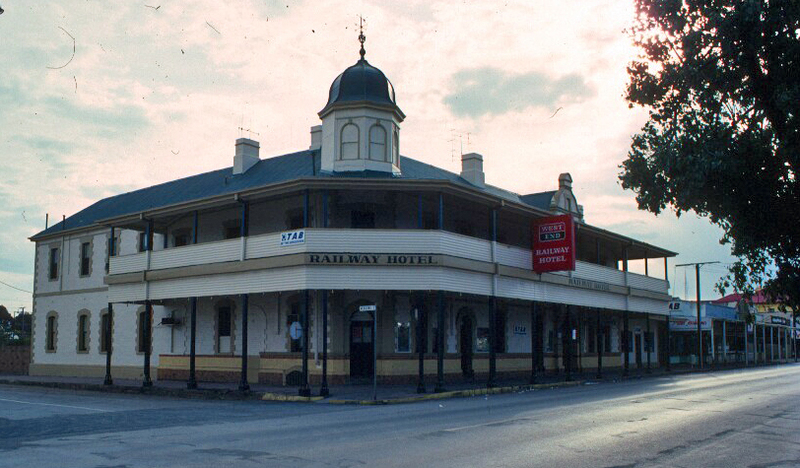 The hotel was another wonderful, old, outback-town hotel, with a broad veranda, second-floor balconies, and an exterior lavishly decorated with iron lace. Inside the hotel, I delighted in the high, elaborately decorated ceilings, abundant leaded glass, and many antiques, even in the bedrooms. Delightful. After briefly pointing out highlights of our surroundings, Richard got us all settled in. I really like Nikki’s husband, Richard. He’s funny, knowledgeable, thoughtful, and very dedicatedly Australian. He has been a charming bush guide, and I imagine that he is the kind of man who’d make a really good, true friend. And Nikki is as open, honest, intelligent, and delightful as I had remembered. I am truly having a wonderful time with the two of them. The three of us enjoyed a lovely dinner–fresh fish, as we were so close to the water. We talked over an after-dinner cider, but then it was time for bed. It has been a very long day, and we have another long day tomorrow. With Hawker being the hub of Flinders Ranges tourism, it is probably not too surprising that our next destination was, in fact, the ranges. Suddenly, the colors changed again from red to green. The mountains, and the national park they inhabit, were named for English navigator Matthew Flinders, who first sighted the ranges in 1802. Abundant mineral deposits initially attracted miners, who at various times mined (successfully) gold, silver, copper, lead, barite, and coal. But now, the big draw is natural beauty and it’s hikers and campers who are drawn to the park. 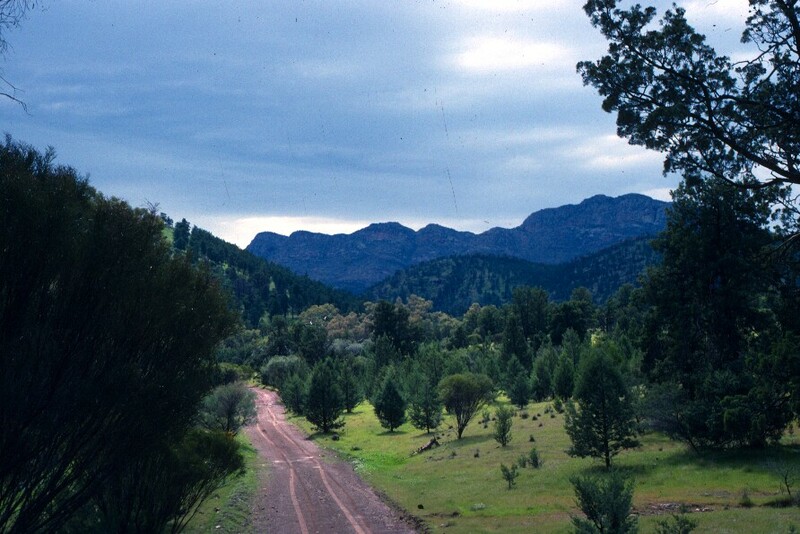 Like other mountain ranges in Australia, the Flinders Ranges one sees today have been worn shaped by erosion over long ages, with the tallest peak today reaching only 3,825 feet. But they are wonderfully handsome, in their wildly sculpted ruggedness, with their geologic history written large across their faces. The ranges are also famed for their spring wildflowers–and it is spring. Richard drove us along the Moralana Scenic Drive, which is scenic indeed. We stopped frequently, to admire dramatic vistas, lush carpets of yellow, red, and purple wildflowers, and abundant birdlife (galahs, corellas, finches, wrens). Kangaroos appeared regularly, which, as always, delighted me. I was in heaven. Richard guided us to a lookout that let us view the dramatic, ragged edge of Wilpena Pound, a natural amphitheater in the heart of the mountain ranges. We alternated short drives with long hikes, breathing in the fresh air and the fragrance of the eucalyptus trees. About half an hour down a path through a steep-sided valley, Richard decided we needed to turn back. Clouds had been gathering, and Richard could see that, in the distance, it was raining. I would have guessed we had plenty of time before the rain would reach us, but Richard explained that, even though the rain seemed fairly distant, a flash flood could come rolling through within a short time after the rain came down, and the stone walls offered us nowhere to go if the roaring water caught up with us while we were still there. So we hiked back out to a safe spot, were we enjoyed the flora and fauna in an area that was not a potential riverbed. But eventually, it was time to leave this glorious place and continue on our way. Started the day cheerfully. We were invited into the kitchen, to have our breakfast with the owner and his wife. (Nikki and Richard have been here before.) Good breakfast in good company, but then we were off. Rolling down narrow roads, we passed through some charming, small towns as we crossed into the foothills of the Flinders Ranges. Richard kept up a remarkable flow of information as we drove and whenever we stopped. First stop (more of a pause really) was the tiny town or Orroroo, which has the odd distinction of sitting on the Goyder Line. The Goyder Line is a line that was drawn in 1865 by then Surveyor-General of South Australia, George Woodroffe Goyderis a line drawn in 1865 by then Surveyor-General of South Australia, George Woodroffe Goyder. Goyder was a remarkable gentleman, who explored widely and understood Australia’s environment long before others did, but despite his many accomplishments, drawing this line is the thing for which he is remembered–and with good reason. This is the line that marks the boundary between land where there is enough rain to attempt agriculture and the land where it is not safe to raise crops, as rain is unreliable and sometimes completely absent. Those who ignored the line discovered that Goyder got it right. 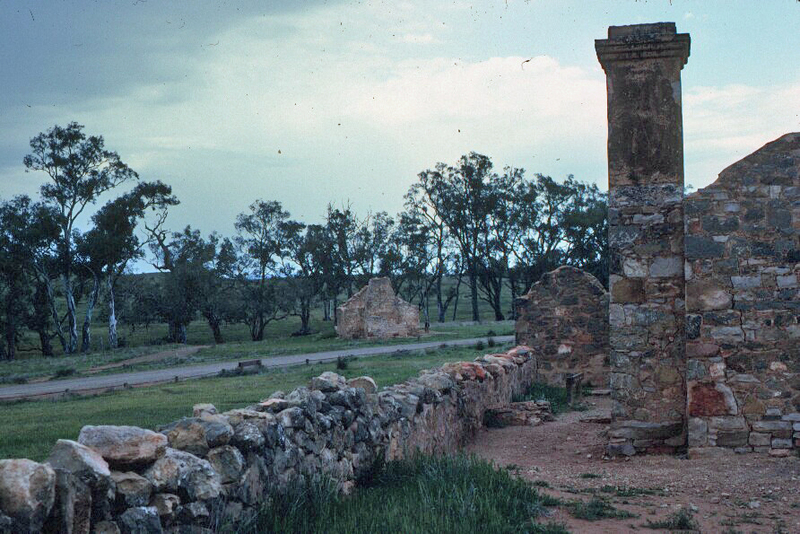 However, between having land on the good side of the line, along with a nearby creek that was dammed early on, Orroroo has survived as a farming community. The scenery changed fairly dramatically as we continued north from Orroroo to Carrieton, transforming from green rural to red outback. After Carrieton, we reached Cradock, a town started in 1878 with high hopes by those who thought Goyder must be wrong and that the old saying “rain follows the plow” would prove true. It didn’t. The town burst into existence and after a few years of drought was largely abandoned. There is still a hotel with a bar (built in the 1880s) and a few other buildings, some closed, but not a lot else. Then on to Hawker. 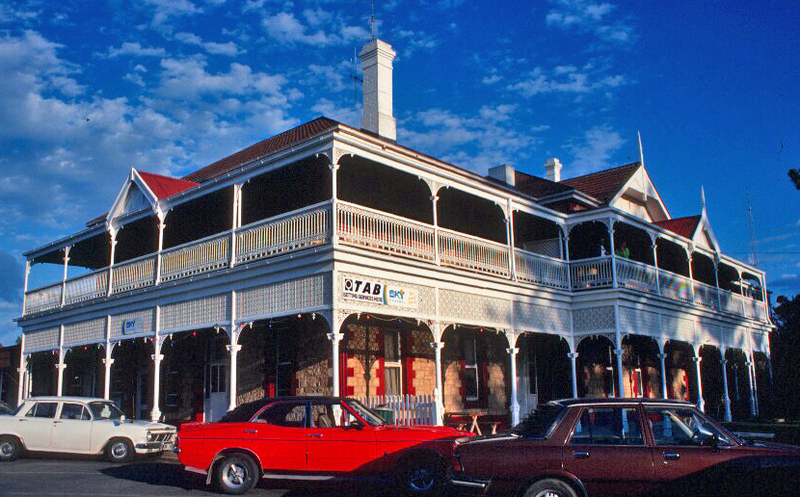 This rugged little town is doing much better than Cradock, largely because it’s a wonderful place for people who plan to explore the nearby Flinders Ranges. Though the town dates back to the late 1800s, and I enjoyed seeing the older buildings at the town’s center, our stop also considered a bit of more recent history. Richard guided us to Hawker Motors and the Fred Teague Museum. First, Richard pointed out the display of photos from the filming of the 1987 movie “The Lighthorsemen.” The film of the astonishing World War I story was shot in this area, using many locals as extras, and the actors, extras, and action were captured by the folks in town. The rest of the museum offers a delightfully quirky collection of everything from mementos of early settlers to a splendid collection of local minerals, all carefully collected by Fred Teague over the decades he lived here in Hawker. The museum is at Hawker Motors because Teague founded that, as well. However, before he ran the garage, he did stints as a gold prospector, drover (Australian cowboy), and, most impressively, spent 18 months driving the Marree-Birdsville Mail, the mail route along the stunningly difficult, 322-mile Birdsville Track, which even today tests (and often wrecks) modern 4WD vehicles. Richard suggested that, if I can get back to Australia again, we could take on the Birdsville Track–which would make up for my having missed my chance on my last trip, when I got stuck in that flood. Something to keep in mind. Then it was back to the house to pack for a weekend away–and then wait for Richard to arrive. I have not yet met Richard, just read about him in Nikki’s letters. However, he was working as an outback guide when Nikki met him, so I have no doubt he will be a wonderful asset as we go off exploring for a couple of days. I’m grateful that they are willing to take off a couple of days to show me around their corner of Australia. I’m looking forward to this. Richard arrived home by 3:30 and found us ready and waiting. We helped him pack the ute, and we were on our way by 4 o’clock, rolling out across the valley, north and east, toward the Flinders Ranges. We passed through miles of sheep raising land, and through the town of Burra. (A quick search on this blog will turn up two posts I did previously on Burra—because it was a favorite spot from my first trip.) We didn’t stop, just admired familiar sites as we continued on, through a brilliant sunset, to the town of Peterborough. Peterborough is a charming, historic town that grew up along the railways, and it was in fact at the handsome, old Railway Hotel that we would be staying. 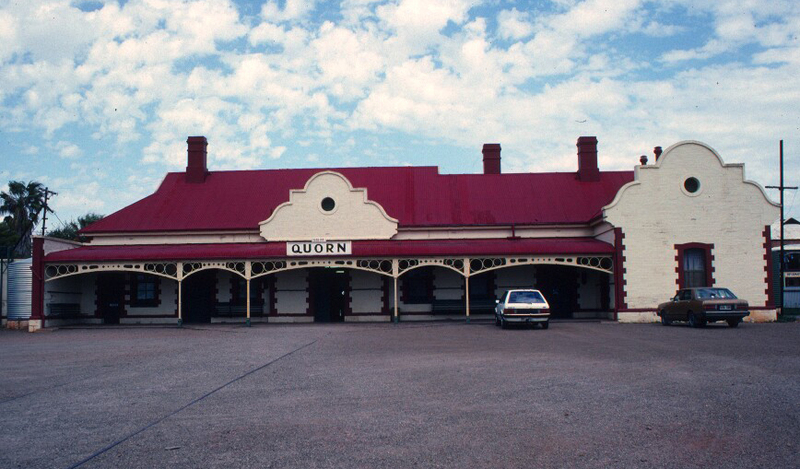 This is one of those classic, two-story outback hotels with broad verandahs that were so commonly built in the late 1800s. This is serious Australiana. My second-floor room faces the front of the hotel and has a door that lets out onto the balcony that wraps around the building. Simply wonderful. I could hardly be happier. We had dinner in the hotel’s bar, and then headed off for a walk through town. We strolled down Main Street, past picturesque storefronts, all of a nineteenth-century vintage similar to the hotel. The town hall was impressive. There were historic markers, but I really didn’t need them, as Richard knows the area’s history so well. We returned to the hotel, where we enjoyed a nightcap and listened to the live entertainment. Both the staff and clientele were as charming as our surroundings. But then it was time to head off to bed. We’re going to be getting early starts each day, to take advantage of daylight hours. And so, good night.